We have two units KVHs Tracphone V7 for sale. They have been used only for about 2 years on board Swedish Coast Guard vessels. 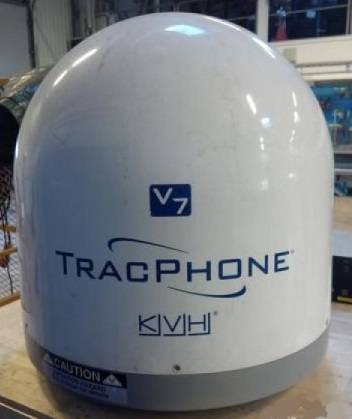 At only 60 cm in diameter KVHs Tracphone V7 is one of the smallest VSAT maritime broadband antennas available on the market, and with the mini-VSAT Broadband network, you can enjoy internet and phone communication almost anywhere out at sea. The TracPhone V7 offers fixed price, seasonal and per-megabyte subscription options so you can choose the right plan to utilize your 2 Mbps max download speed. The TracPhone V7 is the antenna of choice for the US Coast Guard due to its military grade hardware and performance. Offering a ‘cable modem’ experience for you at sea and with no need for a connection to the ship’s gyro-compass, the TracPhone V7 antenna system is sure to fit your maritime voice and data needs. 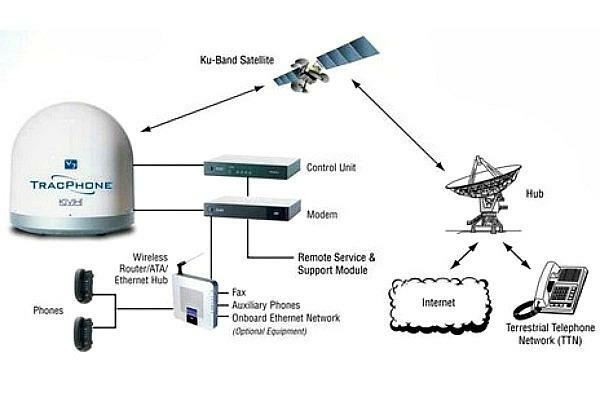 Groundbreaking spread spectrum satellite communications technology offers seamless roaming throughout the worldwide network, and is ideal for heavy data use -Rugged TracPhone V7 is 85% smaller and 75% lighter than standard VSAT antennas so it’s easier to install and less expensive to operate -Data rates as fast as 512 Kbps for ship-to-shore transmissions and as fast as 2 Mbps for shore-to-ship downloads as well as crystal-clear voice service -ViaSat spread spectrum modem and KVH Antenna Control Unit (ACU) offer seamless regional roaming and are perfect for high data use -Chosen by the U.S. Coast Guard for maritime satellite communications -Dynamic, gyro-stabilized tracking and military-grade modem for outstanding performance along with onboard networking via an included Power over Ethernet (PoE) switch. -Choice of fixed price, seasonal, or per-megabyte subscription plans and easy, 1-call activation. New price was about USD 30,000. Our price USD 8,000. Equipment is in our office.